It's getting to be that time of year again, you know, that one that possesses a chill destined to work its way to your bones. For me, that means hot cocoa, warm soup, and frequent trips to hot yoga and the infrared sauna. Since our expansion at Theta, the infrared sauna has been a tool that we have had the opportunity to experiment with, especially in conjunction with our massage and flotation therapy services. The sauna is as intense as you want it to be. You decide whether you want to roast at 145 degrees or 120. It's not recommended to sit for longer than 45 minutes in the sauna either way, but you may find that the hotter it is, the less likely you are to reach the 45-minute mark. So if you are wanting a longer, more relaxing experience, start at a lower temp and work your way up. Here’s a quick read on the benefits of far infrared sauna therapy. Some have said hopping in the sauna after a float or massage can sometimes eliminate that euphoric effect you have from those services. It is true, the intensity of the sauna can wash away that post-float glow or that mushy feeling you get from some deep-tissue knuckling. Others think it is the perfect compliment. My favorite discovery so far is that when the sauna is used prior to floating, your float seems to be even more therapeutic. This makes sense when you think about it. If you have already floated, then you know that sometimes it can take a minute for your body to relax into a proper position. The more kinked up you are, the longer this can take. A quick 45-minute sauna session will get all those muscles heated up, ready to melt into the comfort of one of our float tanks. Several of our clients have discovered this as well and now jump in the sauna before every float. I don't blame them, after my first experience doing this, I was sold. Stay hydrated. Drink at least 12oz of water prior and bring a water bottle if you can. If you're new to the heat, start your temp low, around 120, and raise it as needed. If you have cds you would like to listen to, there is a cd player in the sauna. Some phones will turn off if they get too hot. We provide an aux. cable if you would like to play something from your phone. It is best to keep it outside of the sauna. Everyone is different, but most people have found that using the sauna prior to a float or massage to be more beneficial than using it after. Intermittent cold shower sessions during your sauna is a great way to improve circulation, reduce blood pressure, and mitigate symptoms of rheumatoid arthritis. If you start to get light-headed or dizzy, get out of the sauna immediately and sit down. 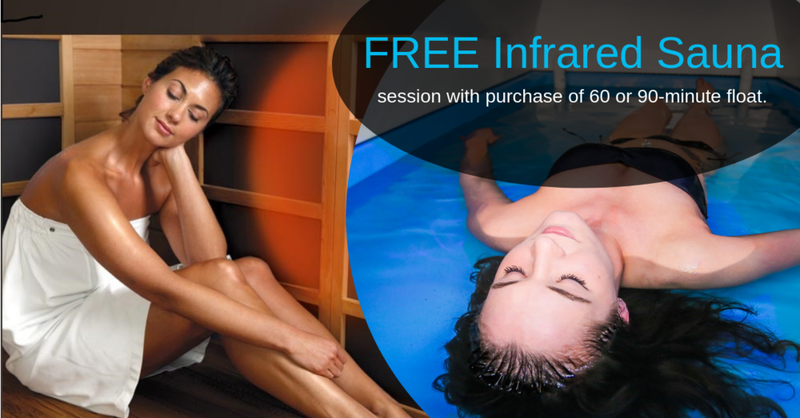 Throughout the month of November, we’re offering all clients a free far infrared sauna session before your 60 or 90-minute floats so you can also experience this warm and soothing package. Click here to purchase it now in our online store. *Offer expires November 30, 2018 and cannot be combined with any other offer or promotion. Sauna session must be used prior to float session on same day.